Welcome to Our Tree Farm! Cal-Sierra Tree Farm, conveniently located in beautiful West Point, CA, is Calaveras County’s oldest and largest “choose and cut” Christmas tree farm. We are proud to be a family owned and operated tree farm since 1960.All of our trees are Tree Fresh Certified. 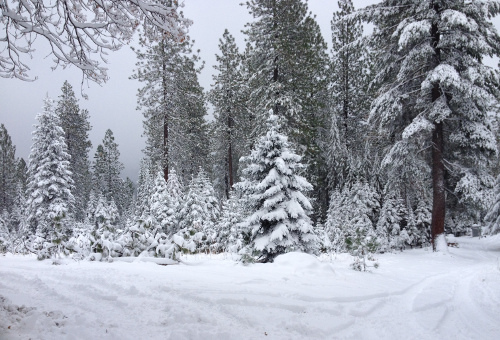 Make the Cal-Sierra choose and cut Christmas Tree Farm a part of your family's annual holiday tradition! Bring a picnic lunch and enjoy our newly renovated picnic grounds, complete with a large firepit, picnic tables, and benches. Wander the lush sun-dappled trails and graded pathways around the 50-acre farm in search of that perfect Christmas tree. Keep warm while you're tree-hunting with our complimentary hot chocolate or coffee. We also have free coloring books for the kids, and candy canes for everyone! We are open weekends. We are also open by appointment on weekdays. Please call (209) 293-7939. 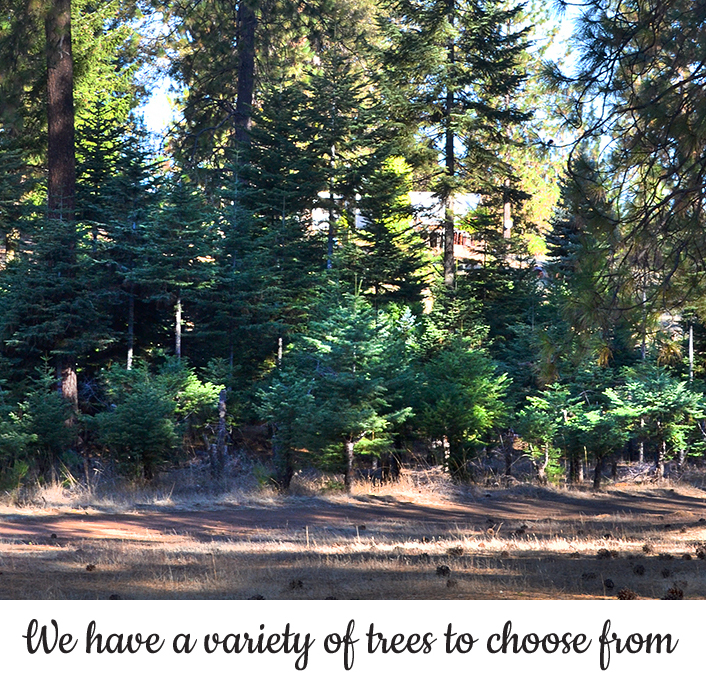 Our huge 50-acre chosse and cut Christmas Tree Farm offers the largest and most unusual variety of trees in the Foothills, including Silver Tip, Blue Spruce, Douglas Fir, Sugar Pine, White Fir, Red Fir, and Cedar. Silver Tips are slower growing than most other species used as Christmas trees, and because of this, they are not found on every plantation. They are the premium and most traditional family holiday tree, with their symmetrical shape, sturdy layered branches, beautiful blueish green color, and wonderful evergreen scent. Bailing - We wrap the tree securely in netting, making it easier for you to load, transport, and set up your new tree. Delivery - If you can't make it out to the farm, we can arrange for local delivery or pickup in Jackson, CA. Fresh Patch - Each tree that leaves our farm will have a Biodegradable “Fresh-Patch” put on the fresh cut on the base of the tree. No more sap on your hands, cars or clothing! "Keeps It Green" Water Additive - Add this to the water to retard needle drop and to extend the freshness of your newly cut tree. Christmas Tree Watering Systems - These long canes (or spouts) will make it easy to keep your tree watered, eliminating the need to bend down or crawl underneath it. Water Bowls - Cut trees drink up to a gallon of water every other day...so keep your tree well hydrated! Christmas Tree Removal Bags - Set up these handy bags at the base of your tree for quick, clean, easy removal at the end of the holiday season. Snack Bar - We offer soup, hot dogs, hamburgers, popcorn, beverages, and other snacks! We offer wreaths, garlands, fresh holly, and over-sized trees as well!